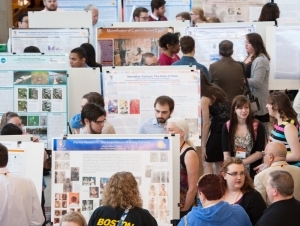 One of Buffalo State’s great traditions, the Student Research and Creativity Celebration (SRCC) allows undergraduate and graduate students from all academic disciplines to present their preliminary and completed research and creative activities in a student-friendly, supportive environment. But even long-held traditions can sometimes use a modern update. With an eye toward sustainability, the 18th annual SRCC, held April 29-30, will feature a paperless online schedule. “This change not only is better for the environment but also includes several features that make it easier to search using presenters’ last names or keywords,” said Jill Singer, director of undergraduate research and 2016 CUR Fellow. Accessible on mobiles devices, the website serves as a useful convenience for browsing SRCC schedules, abstracts, and artists’ statements with ease. A print program, minus the schedule, will be available for student presenters and mentors during the SRCC. Singer noted that students presenting at the SRCC have gained an appreciation of how scholarship is conducted and what it takes to contribute to new knowledge or works of art. The skills students have developed and honed will serve them as they continue their education and throughout their professional careers, she added. "While disciplinary discoveries are very important, it is the discoveries we make about ourselves while engaged in research, scholarly, and creative activities that become even more meaningful over time,” said Singer. On Saturday, April 30, oral presentations will be divided by academic groupings into six sessions throughout the day and held in E. H. Butler Library 208, 210, 314, and 316. Eight one hour-long poster sessions, each with a diverse representation of disciplines, will take place concurrently with the oral presentations in the library’s lobby. Art exhibits will be displayed on the library’s mezzanine level from 8:30 a.m. to 5:00 p.m.